Chromatic Harmony is a suite of interactive audio visual installations that have been developed by the artists in a series of exhibitions since 2000. The various "Movements" of the suite may be combined in different ways to suit any space. Each movement is conceived as an instrument that the public can play, each with its own characteristics and playing technique; ranging from sensors that detect movement in the space to strings that are plucked. Activating the system will affect both the aural and visual elements in different ways. This is a continuing work; the instruments are being continually refined, and new instruments are being developed. Peter Jones and Lawrence Casserley have been collaborating for a number of years on performances within Peter's "Colourscape" walk-in sculptures and other inflatable structures. In 2000 they were invited by Liverpool City Museum to create a sound and light environment similar to Colourscape in the temporary exhibition galleries of the museum. This led to the exhibition of sound sculptures and installations that is now usually known as "Fabulous Sound Machines", but is occasionally shown under other titles. This exhibition is curated by Simon Desorgher, Casserley and Jones under the auspices of the Colourscape Music Festivals. Feb - June, 2000 - "Rainbow Realm" at Liverpool City Museum, Liverpool, UK - "Chromatic Harmony 1" - The first version consisted of three instruments to be played by the public. Each instrument consisted of a set of piano wires stretched across the space above the public, each activated in a different way. Playing the instrument generated computer processed sound and controlled banks of lights shining on vertical lycra sails. Each bank of lamps consisted of the three primary colours, so many colour changes could be created. Some of these were arranged so that shadows of the public would fall on the sails, so influencing the colours produced. For the first instrument, a Soundbeam (EMS Ltd) ultrasonic detector interpreted movement of the public, triggering computer generated sounds to activate the wires via transducers. For the second instrument, the wires could be activated by plucking vertical strings attached to them. For the third instrument, each string had a different activator which was played by pulling on a handle that could move it up and down against the string. In addition, there was a dark space, illuminated only by ultraviolet light, with elastic cords painted in flourescent colours; when plucked they created patterns of waveforms in the dark, while deep sounds, derived from the other instruments were output by subwoofer speakers. Finally, another set of elastic cords rose into the gloom of a high space above the gallery; these too could be activated by the public. The computer generated the sounds for instrument 1 and processed the wire sounds in instruments 2 and 3, as well as triggering all the light changes. In each instrument the computer's response was modulated by measuring the amount and type of activity; sometimes the response was very clear, sometimes more subtle, and sometimes surprising. This piece, and the experience of observing the public's responses to it, formed the basis for subsequent development. July - September, 2001 - "Fabulous Sound Machines" at York City Art Gallery, York, UK - "Chromatic Harmony 2" For this much smaller space a greatly simplified version was created consisting of a combination of the first two instruments from the original version. One set of piano wires stretched overhead, from which two sets of vertical strings descended for the public to play. They could also activate the Soundbeam. One bank of lights played across the space, so that shadows of people playing were cast onto the sails. The sounds emerged from four loudspeakers arranged around the space. This became the model for the most frequently exhibited movement, which has come to be called "Lines and Shadows". April - October, 2002 - "Fabulous Sound Machines - Fantastische Klangobjekte" at Kulturzentrum Kammgarn, Kaiserslautern, Germany - "Chromatic Harmony 3" Because of the very different characteristics of this unusual space, we adopted a video camera to monitor movement, instead of the Soundbeam; we also used two banks of lights to create a variety of shadow effects. Otherwise, this version was similar to the York version. June - September, 2002 - "Fabulous Sound Machines" at The Clocktower, Croydon, South london, UK - "Chromatic Harmony 4" This was essentially an adaptation of the York version to a different space, with the addition of two banks of lights, as at Kaiserslautern. July - September, 2003 - "Fabulous Sound Machines" at The Island Arts Centre, Lisburn, Northern Ireland - "Chromatic Harmony 5" The nature of the space encouraged us to develop our ideas further. The two sets of plucked strings were separated and lit separately. Further improvements were made to the behaviour of the computer program. May - August, 2004 - "Amazing Sound Machines" at Sheffield Millennium Galleries, Sheffield, UK - "Chromatic Harmony 6" This was the largest exhibition we had created since Liverpool, and it gave us the opportunity for new developments, both in Chromatic Harmony and in the other exhibits. For the first time we thought of the instruments as separate "movements", and gave them titles. "Forest" was an adapted version of the piano wire piece, but using a denser array of tall sails that utilised the height of the Millennium Galleries. While this was satisfactory, we intend to develop "Forest" further, so it has a separate identity from the other piece, which is now called "Lines and Shadows". The second movement, "River", was a development of one of the pieces we created for the Robert Owen School at New Lanark (see Appendix). This consists of a wall of highly reflective material which is "rippled" by fans, and colours are projected onto the rippling surface. At New Lanark we used a bank of primary coloured lamps to change the colour of the whole surface, which did not look flat because of the rippling. At Sheffield we developed this by using video projection of more varied colour fields created by the computer. We intend to develop this further at future shows. The sound, in both cases, was made from a sample of water running in the mill lade at New Lanark. "Cave" was a development of the dark space at Liverpool, which we intend to develop further. July - September, 2004 - "Fabulous Sound Machines" at Gloucester Museum and Art Gallery - "Chromatic Harmony 7" For this small gallery we recreated the Lisburn version of "Lines and Shadows" with minor adaptations to suit the space. July  September, 2005 - “Fabulous Sound Machines” at the Tulley House Museum, Carlisle  “Chromatic Harmony 8” In the half octagon at the far end of the gallery we created a much larger ripple wall covering three sides of the octagon. This was lit my both coloured lamps and video projection. A string instrument crossed the entire width of the gallery, with one set of vertical strings. Events were triggered by plucking strings, as well as by PIR sensors and pressure pads in the seating. This was of the first of a series of installations which redefined the relationships between "Lines and Shadows" and "Rivers". June  September, 2006 - “Fabulous Sound Machines” at Scarborough Art Gallery  “Chromatic Harmony 9 (3 x 3)” In the intimate space of Gallery E we created the most radical version of Chromatic Harmony yet. Three separate instruments worked independently and in concert. This utilised three soundbeams, two sets of plucked strings, video projector, a bank of lamps and a new innovation, the use of "Surelight" flourescent wire in the high strings which traversed the whole space. The room was divided by lycra sails in to three zones; at the entrance a Soundbeam controlled the "Welcome" music, as used in the original Liverpool show; to the left and right the other Soundbeams controlled filtered water sounds and the plucked strings controlled lighting. At certain points the overhead wires lit up to link the three sections. July  September, 2007 - “Fabulous Sound Machines” at Ferens Art Gallery, Hull  “Chromatic Harmony 10” Here we were back in a large gallery space, and CH10 took up most of a hexagonal gallery. This combined the Scarborough approach with the large ripple wall of Carlisle. Dividing walls and sails defined the three areas, and Lawrence expanded the range of water sounds, including some recorded at Spurn Head, not far from Hull. Further developments of the computer program improved the integration of the three instruments, the video projection and the lighting. April  May, 2009 - “Fabulous Sound Machines” at Haworth Gallery, Accrington  “Chromatic Harmony 11” Another small space, the most intimate yet, inspired a much reduced installation utilising several of the instruments we have developed, including a small, and improved "Cave". The core of all the instruments is the computer program, created in Cycling74’s Max/MSP/Jitter, which monitors and interprets the actions of the public and generates all the sounds, lighting changes and video projections. 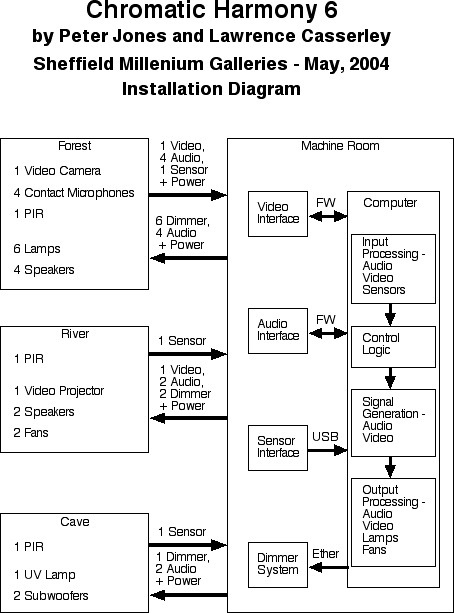 The actions of the computer include monitoring the various detectors (Soundbeam, video camera, PIRs, etc), receiving audio inputs via microphones, making decisions based on the type and number of events, generating and processing audio, generating video and light controls, and outputting the results (audio to loudspeakers, video to projectors, light controls to dimmers). A block plan of the physical devices and computer modules used in “Chromatic Harmony 6” is shown below. Several of the existing movements can be considered as work in progress. It is planned to continue developing these in future shows. "Lines and Shadows" is now a complete piece, which can be adapted to suit different spaces. "Forest" is planned for development, using pressure sensors in the floor to detect movement, and using projections, instead of lights. "River" will be developed to include more than one ripple wall, with related colour projections, and a more complex movement detection system. "Cave" will be developed to improve interactivity, with sound variations to match the moving cords. In addition, development will be influenced by the more integrated instruments used in Scarborough and Hull. It is also planned to add new movements. One projected instrument involves plastic rods, which can be rubbed by the public, creating vibrations that will be detected by the computer. These will trigger sound from within the module (reversing the immersive environment of the existing instruments) and colour changes of the rods themselves. In 2001, Peter Jones and Lawrence Casserley were commissioned by the New Lanark Conservation Trust to create an interactive space in one of the rooms of the newly restored Robert Owen School. New Lanark is a World Heritage Site, a complex of former mills and housing on the banks of the River Clyde, adjacent to the Falls of Clyde Nature Reserve. It is particularly associated with the advanced educational and social welfare thinking of Robert Owen, who was the owner of the mills from 1800 to 1825. The installation in one of the rooms of the Robert Owen School building, has been open since November, 2001. It incorporates a number of the ideas being explored in Chromatic Harmony; indeed, some of them began here. New Lanark is an extraordinary site, an eighteenth century industrial complex in a deep gorge of the River Clyde, surrounded by nature and natural beauty, especially the dramatic Falls of Clyde, which include Corra Linn, the largest waterfall in Britain. A number of elements of this special site are incorporated into the installation, for example: the changing light through the day and the seasons affect the perception of the changing artificial light within the room; the many sounds of water from around the site, and birdsong from the nature reserve, have been utilised in some parts of the installation.